A look back at fun movies. Channing Tatum will be a Marvel superhero? One of the biggest news from this week and last is about Batman… well, about Batman in the new Batman/Superman movie, actually. First up, an official title was announced for the Man of Steel sequel: Batman v Superman: Dawn of Justice. The title is hints at an upcoming Justice League movie after this one. It seems a little odd to me that Superman gets second billing in the title to the sequel to his movie. I assume this title is saying that this series of movies is really a Justice League series and not a Superman-centered series, especially with all the rumors of several other heroes (or their alter egos) showing up in Batman v Superman. Also, I bet the studios think that people would be more interested in seeing a Batman movie. The other thing this title seems to suggest is that Batman will have much larger role in the movie than merely just appearing in a Superman movie. So, I’ve very intrigued about this movie, but I just hope that it concentrates on the Batman/Superman relationship (as well as their villains) and that any other superheroes that may appear in the movie are just kept to brief cameos at the end of the movie. The other big news is that the first image of Ben Afflack as Batman was released, along with a first reveal of the new batmobile. News has been reporting for some time that the Batman in Batman v Superman will be different than the one appearing in the Christopher Nolan Dark Knight trilogy. What I mean is that although it will still be Bruce Wayne who is Batman, the story will not be connected to the Nolan films, much like how the Nolan films aren’t connected to the Tim Burton or Joel Shumaker Batman movies. So, the decision to release this particular photograph seems like a smart move. 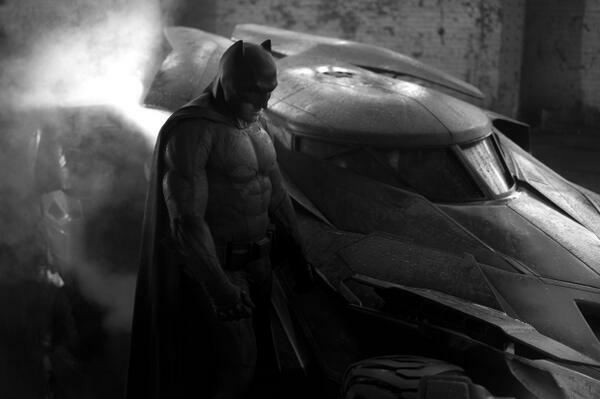 First of all, it’s in black-and-white… so Batman still looks like Batman from all the other movies. However, if you look closer at it, you’ll notice the “ears” on the mask are shorter than they’ve been in any of the other movies and are closer to how they are in the comic books (and, maybe, the old 1960s Batman TV show). This change right away shows that the Batman in Batman v Superman is a different Batman. The next thing you’ll notice is the large “bat” symbol on the chest. 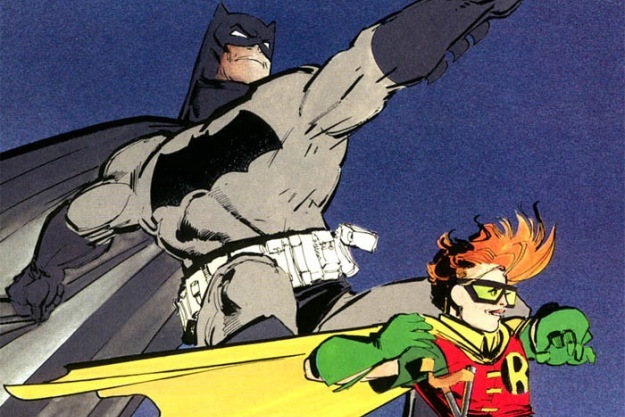 So, the combination of the mask and symbol are very reminiscentof Frank Miller’s The Dark Knight Returns comic series. Which brings me to my last point; I wonder if releasing this particular photo in back-and-white is to get people used to the changes made to the Batman uniform before revealing the next big change. I wonder if they also changed the color of the uniform from the typical black and gray color scheme known of the past movies to the gray uniform with a blue cape and cowl known from the comic books. This would again be closer to how the Batman uniform appears in comic books, especially in that Frank Miller series. So, I’m interested to see how this all will turn out and to see how much other influence Miller’s Dark Knight Returns will be on Batman v Superman. News sites have been reporting that Channing Tatum has been choosen to play the superhero/mutant Gambit in a new movie. I don’t believe the deal has actually been signed yet, but from what I’m hearing, it’s as good as done. However, I’m unclear whether the deal will be for Channing Tatum to play the character in a new X-Men movie or a solo film… or in an X-Men film before spinning off into a solo Gambit film. I don’t really have much to comment on this, as I was never really a Gambit fan, but I think Channing Tatum will be great. I think White House Down and 21 Jump Street show that he can handle an action movie and raise a movie up to be more fun than it might have been if someone else had starred. 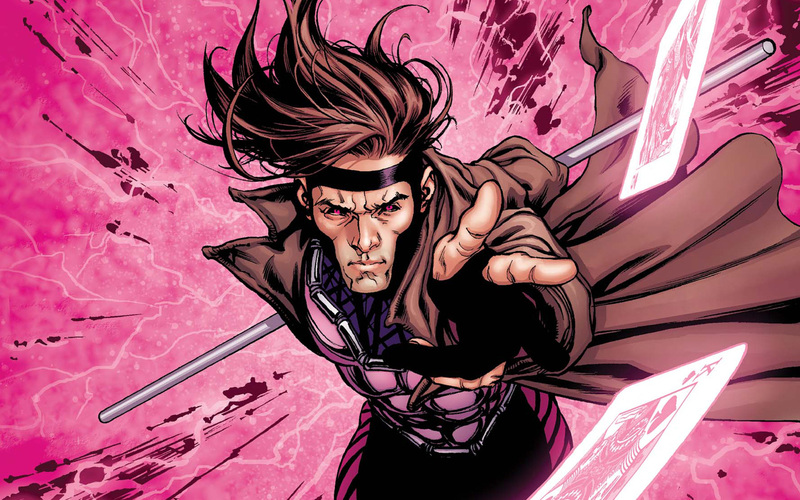 So, whatever this deal turns out to be, I’m sure Channing Tatum’s Gamit will be more fun… or at least more memorable than Taylor Kitsch’s Remy LeBeau/Gambit in X-Men Origins: Wolverine. When I published my Star Wars post the other week, I intended to cover as much as I had to say about Star Wars in that post and not post many updates about the new movie(s) after that. So, I didn’t intend to continue to do Star Wars news… but some interesting things have developed and I’ve found that even minor news has gotten me curious and excited! First, it was recently announced that the director of the recent Godzilla, Gareth Edwards, will direct a stand-alone spinoff Star Wars movie. It’s unclear whether this will be a Han Solo movie, a Boba Fett movie, or a movie about some yet unknown character/topic. Whatever the case, the fact that more Star Wars movies are on the way, besides just the continuing Star Wars story, is really exciting. Speaking of the continuing Star Wars series, J.J. Abrams released a video inviting fans contribute to a new charitable initiative called Star Wars: Force for Change, which is attempting to raise money for UNICEF Innovation Labs. By making a $10 minimum donation through Omaze.com, fans can win a VIP trip to the set of Star Wars: Episode VII (which is rumored to be called The Ancient Fear) and have a chance of appearing in the movie! Besides the video bringing attention to a good cause, it also teases the new movie by hinting at a set in the background. There is also an appearance of a new alien creature! Although it’s a good chance the creature is just a background character, its appearance says something about how J.J. Abrams is handling the movie. It shows that he is bringing back practical creatures, similar to how the appeared in Return of the Jedi, and not just using CGI creatures, similar to how they appeared in the prequels. Most likely, he will be using a combination of the two, but the fact that he wants to use more tangible special effects tells me that he wants the style of the new movies to be closer to the original trilogy than to the style of the prequels, which looked good, but felt a little cold. So, although this video doesn’t reveal much about the new movie, what it hints at has got to put some concerned fans at ease. 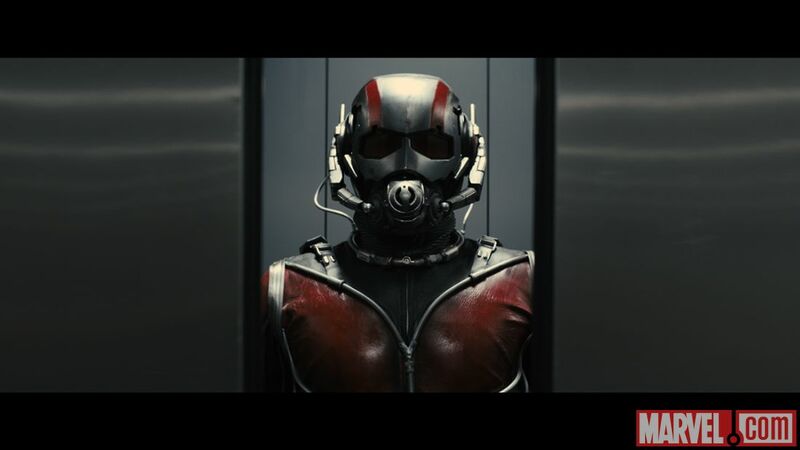 Not the ‘Wright’ Director for Ant-Man? Since a busy Memorial Day weekend caused me to delay posting this, I have to address a surprising bit of big news that was announced over the weekend. Edgar Wright, director of the Cornetto trilogy (Shawn of the Dead, Hot Fuzz, and The World’s End) has left the production of Marvel’s Ant-Man. This is surprising since Edgar Wright had been working on the project for about six years and actually convinced Marvel that an Ant-Man movie could work. Rumor has it that he ultimately left the project because he and Marvel disagreed over the tone of the movie… which is surprising because didn’t Marvel know what it would be getting when it hired Wright? From what I’m hearing Marvel felt it was taking a big risk with Guardians of the Galaxy and was starting to get nervous about the quirky tone of Wright’s (and Joe Cornish’s) script. To me, the news of Wright leaving the project completely drained any interest I had in this movie. I never much cared for Ant-Man, but I became interested when I heard that the movie would focus on the character of Scott Lang as Ant-Man, rather than Henry Pym. For those who don’t know, Pym was a scientist who designed the Ant-Man suit and was basically the typical heroic figure. However, Scott Lang later some how acquired the suit (I believe he stole it) and used it for less-than-heroic purposes before reluctantly becoming more of a hero. So, Edgar Wright’s potential take on the character was really interesting to me since the director is great at creating movies with seemingly unlikeable characters that viewers can’t help but start to love (ie. Nick Frost’s character in Shawn of the Dead or Simon Pegg’s character in The World’s End). Wright’s take on Ant-Man would have resulted in a Marvel movie unlike any other, but I’m sure would have brought in new fans and would have become a cult classic, even if it wasn’t big in the theaters. I mean no one wants to lose money, but I think Marvel has earned itself enough credit that it could take some chances and afford to fail on one or two of those chances… especially its involving a character that is not as beloved as, say, Captain America. Now with Edgar Wright leaving and rumors of changes being made to his script, I’m just hoping the whole thing doesn’t turn out to be more like The Green Hornet starring Seth Rogan, which was just ok… but mostly forgettable. I almost hesitated on posting this bit of news in the hope that the information was wrong or in the hope that Wright would change his mind and return to the movie… but that doesn’t seem likely. The movie was supposed to start filming soon, but with Wright leaving and (I assume) bringing some crew with him, I would hope that production gets delayed rather than the studio rushing a movie with a new director and a script that may not be ready yet. Part of me still hopes that Marvel just delays the movie until it sees how Guardians of the Galaxy does and if that movie is a hit, Marvel can go back to Wright and his script. However, I believe Wright finally said enough is enough and has permanently walked away from the project. Oh well, I’m sure Marvel will figure out how to best handle all of this. I’m sure I will continue to read up on this movie, but I definitely lost interest in it. I only hope that Marvel is able to turn all that around. So what’s your opinion about all (or any) of this? Please let me know in the comment section below! This entry was posted in News Recall and tagged ant-man, antman, batman, batman v superman, Dawn of Justice, episode vii, Gambit, News Recall, star wars, superman by timothyheinz. Bookmark the permalink. I can’t see how the Ant-Man movie will make any money no matter who the director is. When I first heard about this movie coming out I didn’t even know who Ant-Man was. When I realized who he was and what he did I right away thought the movie idea was going to be a bust. It just seems silly. Some comic book characters should just stay in the comics. © Timothy Heinz and Movie Recall, 2013.